We're a family of six (including Noah) plus 20 camels, donkeys, dogs, cats and free range chickens and ducks. We're keen animal lovers ad business owners of AustralianCamels.com. After Noah passed away we never knew if we could make life good again. We struggled to think of how we can continue to run our business, but with our sweet little boy Noah's guidance and his constant presence in our lives we have kept going on. As stated in Noah's Story we didn't get to bring Noah home to our farm and family because there was no access to a Cuddle Cot in our rural area. 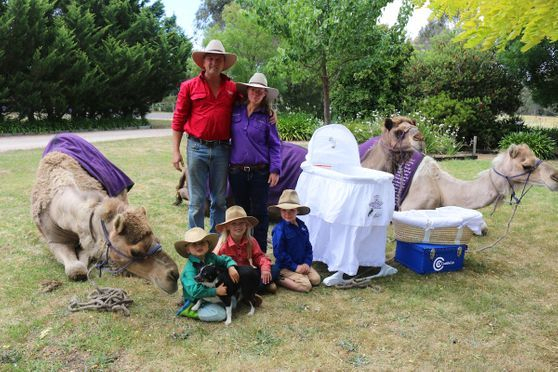 Before getting into a hole of sadness too deep we decided to do Charity Camel Trek to raise money for a Gippsland community based cuddle cot and raise awareness of infant and neonatal deaths, miscarriage and stillbriths - to break the taboo surrounding the subject. The trip was such a success with raising over $7,000 (not quite our $10k goal) and so many people appreciated what the trip was about. Unfortunately so many other families have experienced a similar thing also. 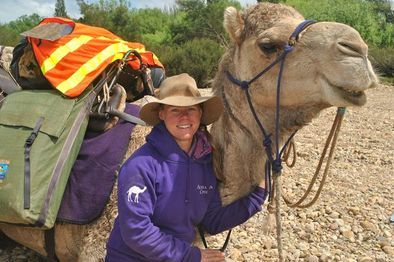 The Camels for Cuddle trip was very healing for our family, especially Tara who undertook the 153km with camels Jack, Coco & Syhid. The camels we're major hits in the towns they passed through and served as a great appeal for people to ask more questions and offered healing to those that bonded with them. In India camels are a symbol of love. Once you get to know a camel you'll soon learn why they are the symbol of love. This is why they are the face of the Gippsland Community Cuddle Cot. Tara on the Camels for Cuddles Charity Camel Trek with 'Jack'.